Futsal is a form of 5-a-side soccer that originated in Brazil in the 1930’s. Futsal is an abbreviation of the phrase Futebol de Salao (Portuguese) or Futbol Sala (Spanish), which basically translates as soccer in a large room, i.e. indoor football. FIFA officially adopted the name Futsal in 1989 as part of their strategy to promote the game throughout the world. Futsal is now played both indoors and outdoors, on pitches roughly the size of a basketball or netball court with a ball which is smaller and heavier than the outdoor soccer ball, which makes for a reduced bounce. The smaller pitch means decisions have to be made more quickly, and moves have to be far more accurate, hence Futsal is a great skills development game for all ages. 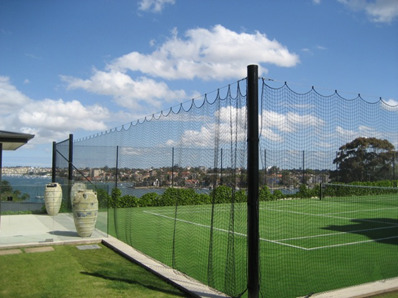 All Grass Sports Surfaces has installed a number of Futsal surfaces in NSW, using TigerTurf tufted polypropylene synthetic grass. 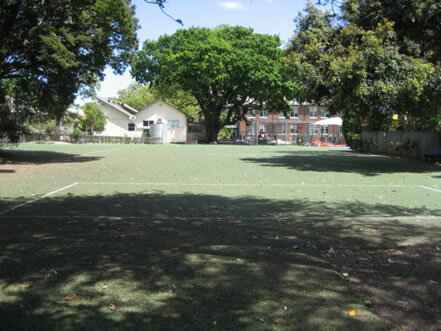 Combination of tennis courts and Futsal pitches installed by All Grass Sports Surfaces at Camperdown Tennis Centre, Sydney. All Grass Sport Surfaces Pty Ltd.
All Grass Sports Surfaces Pty Ltd - Platinum Approved Distributor and Installer of TigerTurf sports surfaces and sports acrylics – Tier 1 Agent for Rebound Ace Sports acrylic surfaces - National Member of the Housing Industry of Australia - Builder Member of the Sports Contractors Association - NSW Builders Licence No. 31255C.